As capitalism continues to lift millions of people out of dire poverty around the world, ironically, the most advanced nations are mired in an era of stagnation that has inflamed populists on the left and right and revived the specter of socialism, which has reportedly lost its stigma among milennials. Fortunately, the OECD, a grouping of the 36 wealthy nations, has added its voice to the chorus of "millionahs and billionahs" who believe they have found the solution to the worsening economic plight of the unwashed masses. To wit, the organization published a report on Wednesday warning that the simmering sense of financial uncertainty that inspired many members of the American middle class to vote for Donald Trump isn't some made up phenomenon, like some of the president's political rivals have insisted. 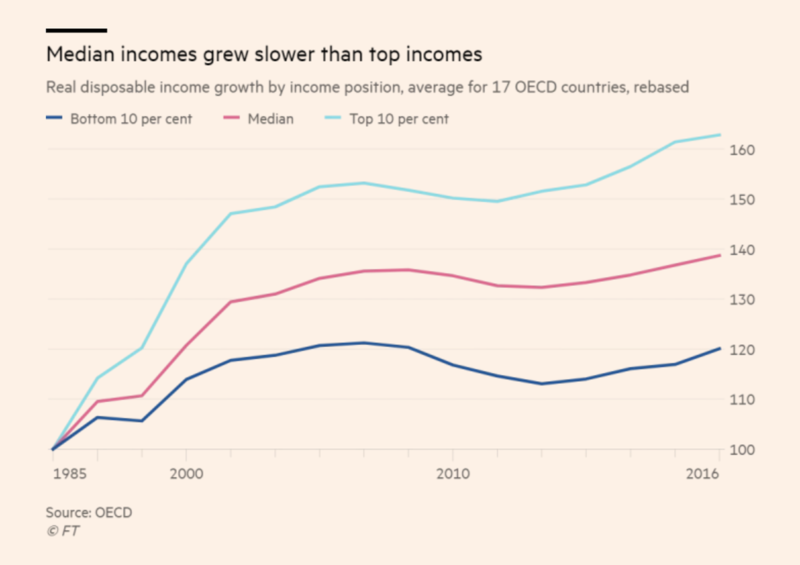 Across the developed world, low- and middle-class people are struggling with stagnant income growth, rising lifestyle costs and unstable jobs, which the organization warned risks fueling "political instability" should these problems go unchecked. Meanwhile, the costs of housing and education were rising faster than inflation and middle-income jobs faced an increasing threat from automation. Gabriela Ramos, OECD chief of staff, said this economic storm would push voters further into the arms of populist parties espousing policies like protectionism and other anti-establishment policies. Ramos said stagnating incomes and unstable career prospects "fueled perceptions that the current socio-economic system is unfair and that the middle class has not benefited from economic growth in proportion to its contribution." "Today the middle class looks increasingly like a boat in rocky waters," he said. Over the last 30 years, middle-class incomes have grown far slower than upper class incomes, while the proportion of the American population that qualifies as "middle class" has fallen by about 5 percentage points. Now, only 51% of Americans are considered 'middle class'. Across OECD member states, incomes for the middle class haven't risen in a decade, even as the cost of education, health-care and housing have risen rapidly (but remember: The Fed can't find any evidence of inflation in the economy). Today, both parents in a household need to work for it to qualify as middle class. Thirty years ago, families could get by on just one. 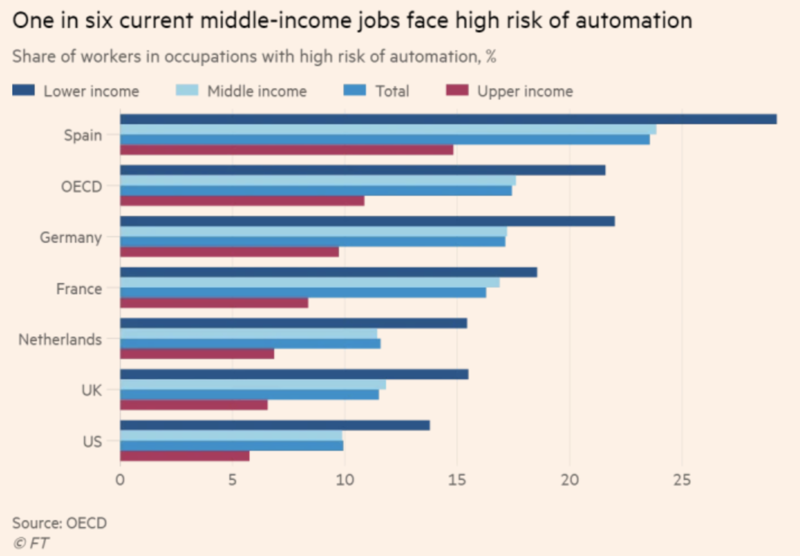 Looking ahead, the situation looks even more dire: one in six middle class jobs are at risk of being eliminated thanks to automation. As a result, despite being the most educated generation in the history of humanity, the millennial generation will likely be the first to see a lower standard of living than their parents. "The current generation is one of the most educated, and yet has lower chances of achieving the same standard of living as its parents." Leave it to Rabobank's Michael Every to break down the hypocrisy in the OECD's policy recommendations. It's not that the recommendations are inherently idiotic. It's that a supranational organization which, more than any other, represents the global elite who are largely responsible for the economic malaise gripping the developed world, is prescribing a policy regime that stands in direct contrast to the policies its members have propagated for the last four decades. How can the OECD shift from advocating for austerity and central bank interventionism, the latter of which has largely fueled the bubble in asset prices responsible for the yawning gap between the rich and everybody else, to the platform of Democratic socialists like Alexandria Ocasio-Cortez. Again, that's not that these policies are inherently bad, it's that in recommending them, the OECD is demonstrating a profound lack of self-awareness. Furthermore, it's unlikely that these policies alone would precipitate the change the organization says is so badly needed. They would still need to work out that "this is not compatible with central-bank asset-price inflation, which makes housing unaffordable, and with free trade, which makes higher state spending unaffordable." In short, the OECD's new "populist" platform isn't quite populist enough. Please explain to slow learners like yours-truly how this rallying cry sits alongside OECD policy prescriptions like austerity, massive house-price, education, and health-care inflation, outsourcing, free trade, free-movement wage competition, and tech disruption? That’s right: it isn’t. So the OECD now says “to help the middle class, a comprehensive action plan is needed...Governments should improve access to high-quality public services and ensure better social protection coverage...policies should encourage the supply of affordable housing. 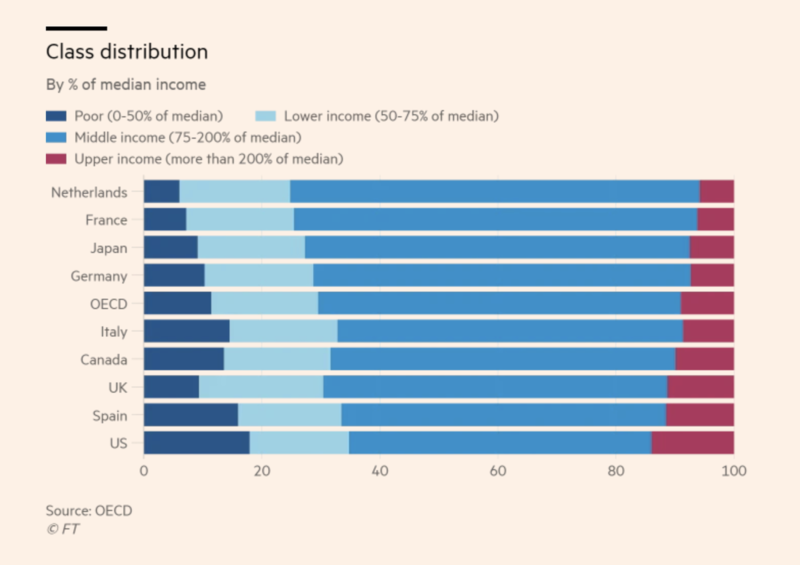 The rich man’s club of the OECD wants higher taxes on capital; higher taxes on the rich; stronger unions; more public spending; mortgage relief; more affordable housing; and better social services. A complete reversal of the socio-economic policies of the last 40 years. All they have to do now is work out that this is not compatible with central-bank asset-price inflation, which makes housing unaffordable, and with free trade, which makes higher state spending unaffordable and higher wages uncompetitive. Either that, or the OECD will have to embrace Modern Monetary Theory. Pick your black hole – or wait for populists to pick it for you, because when the middle-class goes, everything goes. Alternatively, they could embrace MMT. But at the end of the day, it might be too late for organizations like OECD to effect meaningful reforms in the system they helped create. For that, we'll need to wait for the demise of the middle class to stoke another wave of populist rage.